Pad Thai is made-in-minutes, easily spiced-up for parents or down for the kids and a really flavour-packed meal. Kids like bashing up raw peanuts with a pestle and mortar, cracking eggs to beat into the noodles and squeezing in the limes. 'Fish sauce' doesn't always sound appealing but once it's in, it just adds a savoury back-note of flavour - so call it 'noodle sauce', 'Thai sauce' or whatever else you can think of so that the name alone doesn't put the kids off. In place of chicken, you can use frozen prawns, or leave out the meat or shellfish altogether and make a quick veggie version (see below). 1. Boil the kettle. Get the kids to bash up the peanuts in a pestle and mortar or pulse once in a food processor. Rip up the coriander or snip with kitchen scissors (kids find this easiest with multi-blade scissors like these, although watch their fingers). Show the kids how to crack the egg into a bowl and let them beat it gently with a fork. Set the peanuts, coriander and beaten egg aside. 2. Put the noodles in large pan, pour over boiling water and cover with a lid. Cook according to pack instructions (this will only be a few minutes). 3. 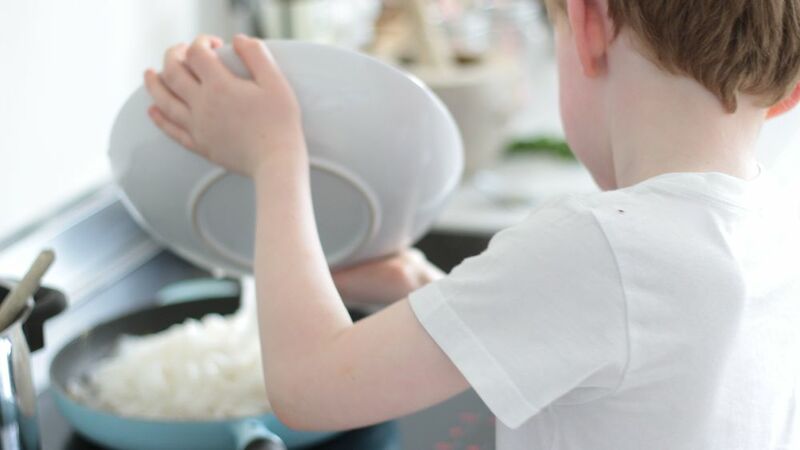 Show the kids how to crush the garlic in a crusher (there's no need to peel it if you use one a crusher which is less fiddly for the kids). Pop in a frying pan or wok with a little sesame oil. Help them to top and tail the spring onions then snip them up with a pair of kitchen scissors and fry for a minute or two over a medium heat with the garlic. 4. Add the cooked chicken or frozen prawns and cook for another few minutes until the chicken is piping hot or the prawns pink. 5. Add the beaten egg to the pan or wok and move it around with a wooden spoon to mix. It'll cook almost instantly. Quickly drain the noodles through a colander and help the children add these to the pan along with the fish sauce. Cut up the limes and get them to squeeze them over. Add the peanuts and coriander to the pan. Toss everything together with tongs or your wooden spoon then divide between plates. Sprinkle over dried chilli flakes for the grown-ups if you like. Follow the above recipe, omitting the chicken or prawns and adding a handful of frozen peas and a little grated carrot at the same time as the garlic and spring onions.